Industrial properties along the Highway 85 corridor north of Sterling Ranch are at a premium, with a parcel of raw ground recently selling for more than $13 per square foot. KBK Properties LLC, which is affiliated with Greiner Electric, bought 1.3 acres at 8135 W. Brandon Drive in Littleton for $750,000, or a record $13.24 per sf, for storage and vehicle parking. Jennison Service Company LLLP, whose owner retired from the construction industry, sold the property. Located just off South Santa Fe Drive/U.S. 85, it was the last developable site in what is known as Park 85. The property is zoned for heavy industrial uses. 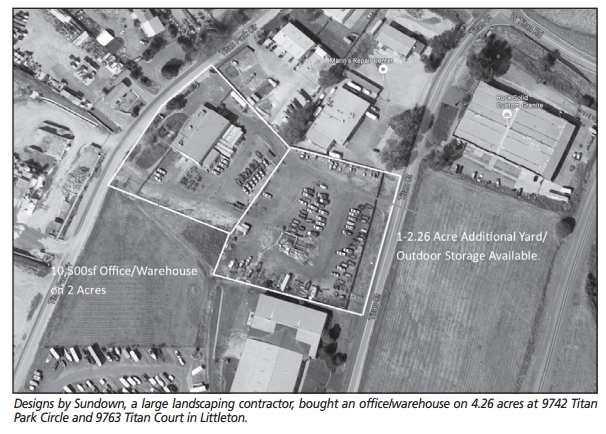 At nearby Titan Industrial Park in Littleton, a user acquired a 4.26-sf site with a 10,457-sf office/warehouse for $2.2 million, or $210 per sf, while a land parcel across the street sold for just under $8 per sf. Existing tenants acquired both properties. Designs by Sundown, a large landscaping company with corporate headquarters on South Santa Fe Drive, had been leasing the property at 9742 Titan Park Circle and 9763 Titan Court for materials and vehicle storage and exercised an option to buy. The office/warehouse, built in 1985, has 4,000 sf of office space, a reception area, conference room and server room. The warehouse, with radiant heat, has 18-foot ceiling height. The property has two entrances, offering good flow for vehicles, and currently is served by well and septic. However, Knott said that with Sterling Ranch coming, the park will have access to public water. Knott and Smith represented the seller, Titan Park Circle CO LLC. Ken Turnbull of Metro Brokers represented the buyer. Across the street at 9831 Titan Park Circle, Tricycle Lane Texas LLC bought 2.4 acres of ground for $825,000, or $7.89 per sf. The buyer is affiliated with Bestway Concrete, which, along with two other tenants, has been leasing the property. “We offered it to tenants first, just out of courtesy, and they jumped on it,” said Knott. The property is fenced and has potential for future development. Bestway uses it for vehicle storage. Knott and Smith represented the seller, the William L. Myers and Connie J. Myers Revocable Trust.